The whippet is a dog breed quite similar to the greyhound, though smaller in size. Typically, it can run as fast as 35 miles per hour, making it the fastest dog breed of its size. 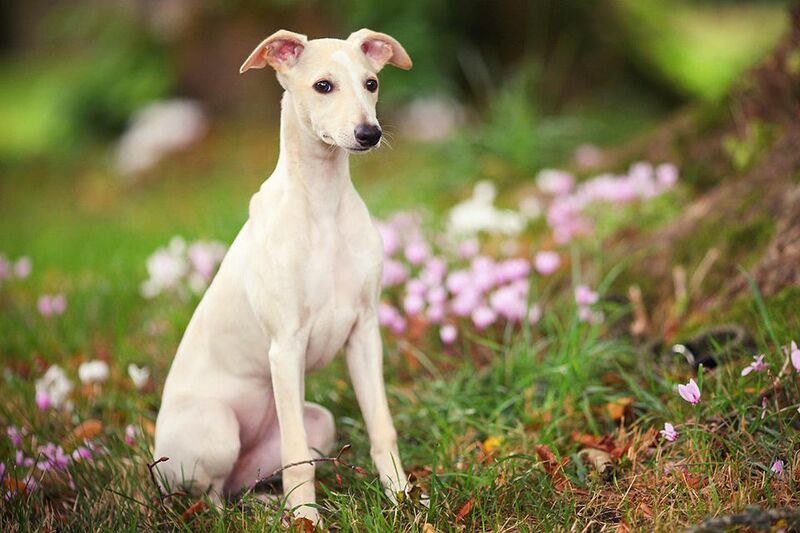 This sighthound is also known for its alert, friendly, and playful demeanor. The joyful whippet is a lovely and loyal companion that makes a delightful addition to almost any household. As a dog that is not much of a barker, fairly inactive indoors, and just needs a good walk or run, they do well for apartment living. Coat and Color: Short, smooth coat in a variety of colors including black, blue, fawn, red, white, and various shades of brindle, or a combination of any of these colors. The whippet was the result of selective crossbreeding between greyhounds and terriers in England, explaining its appearance as a "miniature greyhound." Once used by the English working class to hunt small game (particularly rabbits), the breed eventually became quite valued in the sport of coursing. Much like the greyhound, the whippet is an extremely swift runner and is considered the fastest dog of its size. The whippet was first brought to the U.S. in the late 1800s and registered with the American Kennel Club (AKC) in 1888. Surprisingly, the breed was not officially recognized by the English Kennel Club until 1891. The whippet has a very short, smooth coat that needs very little grooming. The breed sheds at a low to moderate rate, but shedding tends to increase seasonally. Most whippets only need periodical brushing with a grooming mitt and occasional bathing. Their nails should be kept short to prevent slipping on slick floors. Whippets are full of energy and sometimes a bit goofy, but they also have a lazy side when indoors. In short, don't expect your whippet to stay off the furniture. The whippet will do well in an apartment as long as you can take him for a walk or to a dog park. Without exercise, you may see some destructive indoor habits, but they will wear off steam quickly when exercised. They tend to get along well with other dogs without being prone to being aggressive around them. The breed does love to run, so be sure to provide plenty of space and daily exercise. As a sighthound, the whippet is likely to run after anything in motion, and will not easily find its way back. The breed should never be permitted to run off-leash, and the "invisible fence" is not an option as they won't stop once they spot something to chase. A fence that is 5 to 6 feet tall will keep them in the yard. Proper training and socialization are both important for the whippet, as with all dogs. While the whippet may not seem like the sharpest tool in the shed, the breed is able to learn well with persistence and encouragement. Whippets are very affectionate with their families prefer not to be left alone. They were a house dog from the beginning rather than a guard dog or part of a hunting pack. Unfortunately, they can be prone to separation anxiety. They also seem not to do as well with crate training, exhibiting claustrophobia. If your dog must be alone most of the day, a whippet may not be the best choice. They are rarely aggressive and act quite welcoming to strangers. For this reason, they do not make ideal guard dogs. In fact, the American Whippet Club says the whippet often shows "Excessive Greeting Disorder" for both his family and anybody visiting. You will need to train your whippet not to be over-exuberant when you come home or somebody rings the doorbell. It is important to know that cats and other small animals may provoke the whippet's predatory instinct. Proper socialization is essential, but the breed might never truly be trusted around small creatures. They are suitable for multi-dog households as long as any other breeds are similarly well-behaved with other dogs. Whippets tend to get along extremely well with children. Their size is just right for not knocking over small kids and they are big enough not to be easily injured. However, you will need to make sure your kids are old enough to treat a dog with respect. In return, a whippet can be a great companion for kids, especially if they play fetch and other active games to wear off energy. Anesthesia Sensitivity: All sighthounds are more sensitive to barbiturates than similarly-sized dogs. Ensure your veterinarian is familiar with this before any treatments requiring anesthesia. A whippet will need two meals a day of up to 3/4 cup of dry dog food. Individual needs depend on size, activity level, age, and other factors. Your dog's nutritional needs will change throughout his life, so discuss what is appropriate with your veterinarian to get recommendations. Be sure to monitor your pet's weight to ensure he doesn't pack on any extra pounds. As with any breed, if you think the whippet is the right dog for you, be sure to do plenty of research before adopting one. Talk to other whippet owners, reputable breeders, and rescue groups to learn more. There’s a wide variety of dog breeds out there. With a little research, you can find the right one to bring home. What is an American Staffordshire Terrier? Should You Get a Bluetick Coonhound?